A few weeks ago, my dad broke his hip. So we stayed at his home in La Tour-de-Peilz for a few days to help him get around. These were not the best circumstances, but at least it was an opportunity to catch up on long overdue father-son time, something we both deeply enjoyed. As we grow older, we realise that these moments are precious and we should enjoy them while they last. We had a great time together, sharing family stories with Lillie. This also gave me the chance to sneak out for a few rides on the roads where I fell in love with cycling. I trained here for 30 years before moving an hour away to the ski resort of Villars-sur-Ollon. The Vevey-Montreux region is located at the foot of the Alps near the eastern end of Lake Geneva, the biggest lake in Western Europe. Vevey hosts the worldwide headquarters of food giant Nestlé and this is where Charlie Chaplin lived for 25 years, from 1952 to his death. One of the first Swiss tourism resorts in the 19th century, Montreux is famous for its annual Jazz Festival. The event has featured many music stars since 1967, from Miles Davis to Ray Charles, David Bowie and Prince. Freddie Mercury lived in Montreux and his statue is one of the city’s main attractions. 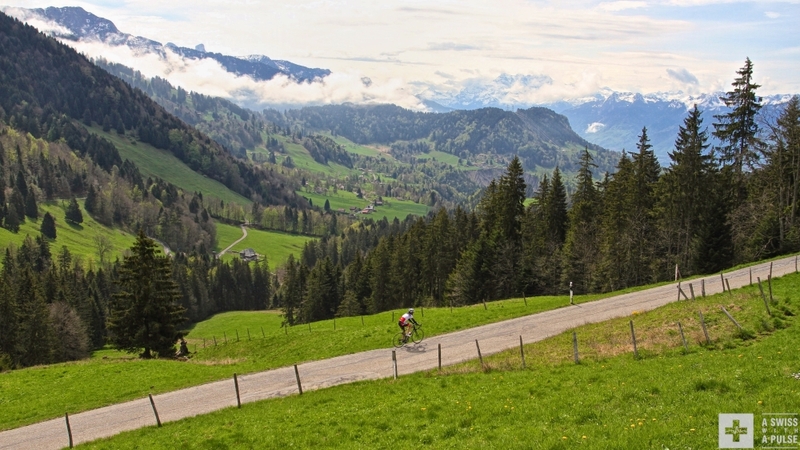 The Riviera vaudoise, as the region is called, is also a great cycling playground. The mountains are not very high, as the tallest peak, Les Rochers de Naye, is at 2042m. Most paved roads do not exceed 1600m. 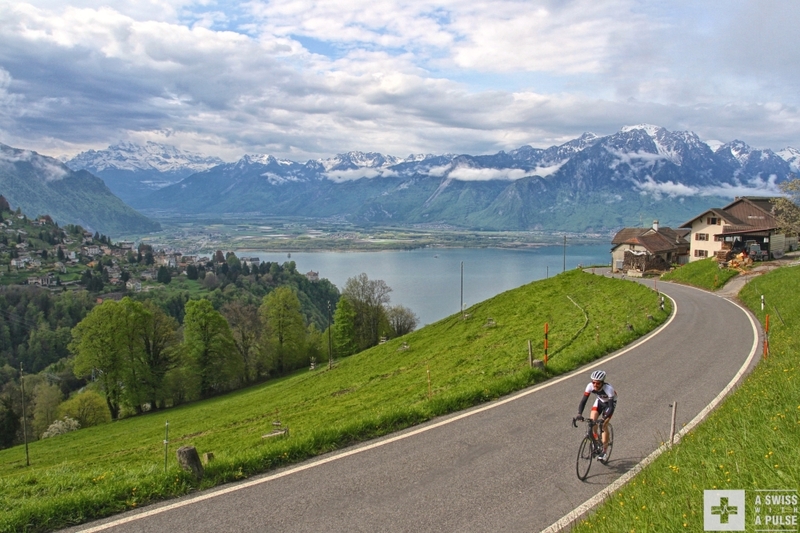 However, there are plenty of climbs with great views on the Alps and Lake Geneva region. No wonder 1996 Olympic Champion Pascal Richard trained in this area during his successful career. There are different ways of going up each mountain. This makes it possible to vary training and not ride the same roads over and over, which I find quite boring. The climbs offer different gradients too. My favorite ‘easy’ climb goes from Montreux to Les Avants via Chernex. 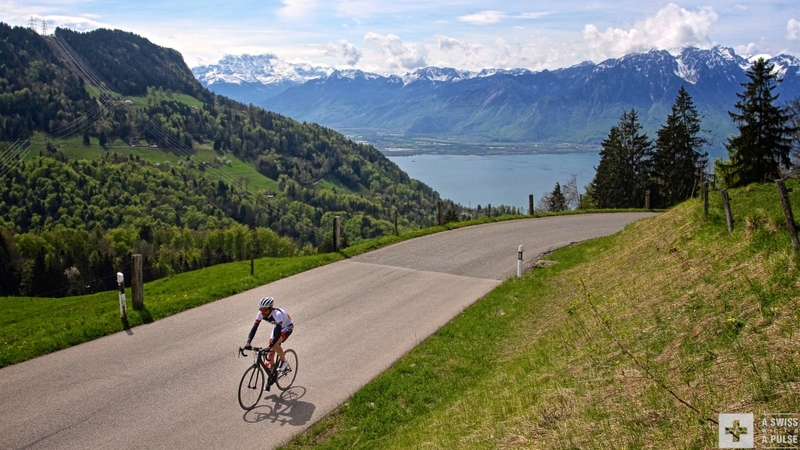 It offers a mild gradient of 7% over 6.5km and great views on Lake Geneva. 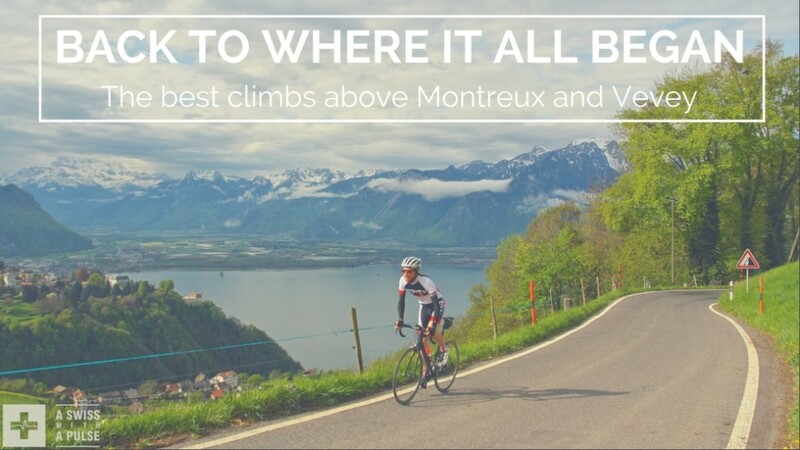 In Les Avants, you can stop for coffee and ride back down to Glion and Montreux via a narrow but beautiful road, or continue up to Sonloup and Orgevaux over a steeper climb. However, my favorite way of riding up to Orgevaux is a much tougher challenge. From Fontanivent, it starts with the 1,8km, 10% climb to Chamby. 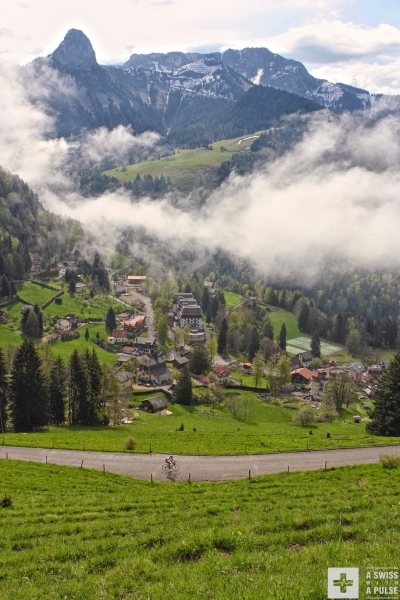 It is followed by a relatively easier segment to Vallon de Villard (2.9km at 8%), featured on a stage of the 2003 Tour de Romandie (see from 14’ to 26’ in this video). Then it continues with a killer 13% sufferfest to Sonloup along a dismantled ski lift. But there’s more. Just as you reach Sonloup and think it’s over, the coup de grâce is waiting for you with another 125m of climbing, again at 13%. Not sure you can fully appreciate the view on Vevey and the UNESCO World Heritage List site of Lavaux in the background while you are climbing. The real top is reached after a short descent and a final push. The stats for the whole climb: 7.8km at 9%, a true Category 1 experience, which does not appear to thrill the local Strava users. Make sure you stop for a coffee and a delicious tarte tatin at the Restaurant de la Cergniaulaz before heading down. 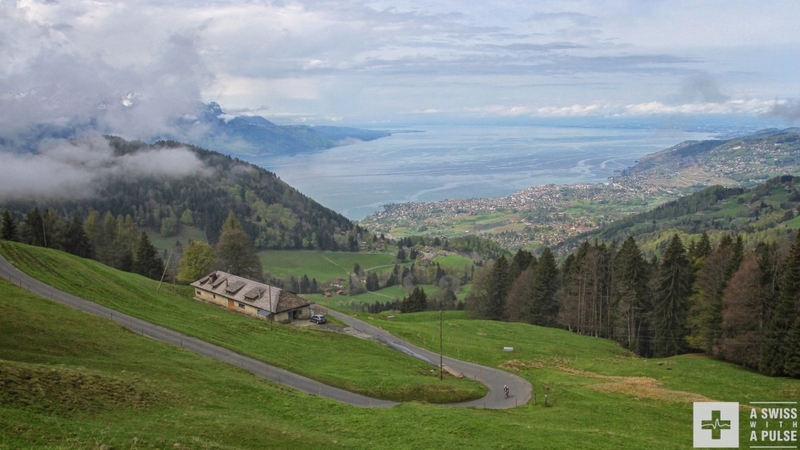 Vevey is dominated by Les Pléiades at 1360m. There is a small ski resort at the top and it hosts a hill climb from Blonay every year as part of the Giron du Rhône regional racing series. I have been a regular since the early 90s and enjoy battling with my old rivals while trying to keep up with the new kids on the block. So far I am still doing OK. 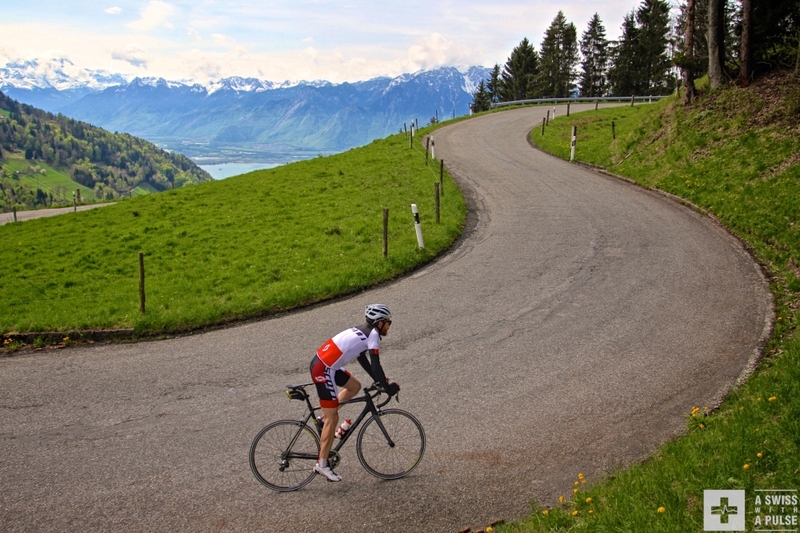 The climb is not too steep and it is also possible to ride it at a more leisurely pace. It is a great afterwork outing for local cyclists, with nice views all the way to the top. Beautiful views on Lake Geneva make climbing easier. Or not? PS: if you are visiting the area and are looking for good loops, feel free to contact me for more advice. To stay up to date with the new posts on this blog, follow me on Facebook, twitter or Instagram.